I recently received some awesome books in the post that I'm going to sneakily hide away for Daddy BookBairn's Christmas (Daddy, if you're reading this... stop!) and several people have asked me about them so I though I would do a review of them! Please bear in mind these were not intended for BookBairn and aren't really suitable for her age group so, there won't be any photos of her reading them I'm afraid. These books are for Star Wars fans! If you have a little one that you are keen to get into Star Wars, it might be worth considering the Star Wars Epic Yarns series by Jack and Holman Wang (you can find them here). I haven't read these myself but I love their Cozy Classic series, which BookBairn and I reviewed earlier this year and if the Star Wars ones are as good they would be great for toddlers and little readers. The Star Wars series I got for Daddy BookBairn is by Jeffrey Brown and is a series of books that compile comic style cartoons of those heroes that you know and love from the films. But in this re-imagining Dart Vader is the devoted father to young Luke and Leia who, like most children, get up to mountains of mischief whilst their dad (unlike most dads) is trying to take over the galaxy. 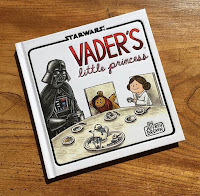 I originally got a copy of 'Vader's Little Princess' for Daddy BookBairn as a joke and it is a hilarious book, but it is definitely a book that will appeal to Star Wars Fan Dad's of Little Princesses. So I was surprised to find that the two books included in this box set would appeal to Star Wars fans of (almost) all ages! I only say almost because younger readers will not get all of the jokes and would need a reasonable familiarity with the films and characters to 'get it' but for kids (big and small!) who love Star Wars, these books would make a great Christmas gift! The box set I received is a special edition gift set which included two books - 'Goodnight Darth Vader' and 'Darth Vader and Friends' - as well as two exclusive art prints which are presented inside a lovely illustrated envelope, all inside a beautiful box! As you can see from the videos above, I thought it would be easier to show you inside these books so you can really get a feel for them, the illustrations are funny, colourful and packed full of details from the Star Wars franchise. I love the cute and quirky take on young Luke and Leia - and little Chewbacca is just adorable! Darth Vader is the doting dad whose children run rings around him, even though he can command the Death Squadron without a second thought. Does this ring bells for anyone else? Daddy can don a suit and commands his office but just can't resist the "one more story" pleas from his little princess! I also particulary adore the fact that one of the special edition prints is of Darth Vader taking little Luke, Leia, boyfriend Han and Chewbacca to the library! It's a perfect blend of passions from our house! The books in this box set are a larger format, which makes them perfect for sharing with your little jedis! Simply, a great gift for dads and little jedis alike! Find the Box Set and the rest of the series clicking the image above. *This contains Affliate links. Ooh thank you for sharing Kim. These look fantastic! These sound very interesting! Personally, I can't stand Star Wars, but my husband is a big fan and would love these!